Starting from the F4 and going backward, we have retraced the history of Nikon cameras. In the last article, we went all the way back to Nikon's very first camera (Nikon "I"), and along the way we've discussed the birth and origin of each camera. However, we have yet to talk about the Nikon F5, the newest addition to Nikon's SLR lineup. I had planned to address that in this issue, but while examining the F5's shutter unit, I realized that it inherited most of its technology and design concept from the Nikon Camera ( Nikon "I"). Therefore, in this issue I'd like to begin reviewing the history of shutter technology. We'll cover the development of the F5 in a later issue. The F5's shutter unit is located at the center of the body. The vertical-traveling ultra-light shutter blades, blade brakes, double-light-shielding unit for front and rear curtains, X-contact for electronic flash units, and more are all built into the shutter unit. Each operating part is designed to be light and to have as little resistance to friction as possible. The shutter as a unit is made to function accurately even after extended use. The F5's shutter represents the results of years of experience Nikon's engineers have acquired, all the way from the Nikon "I" days up to the Nikon F4. Let's take a closer look now at the various improvements and refinements the shutter has undergone. The first Nikon camera, the Nikon "I", applied a horizontal-traveling, cloth curtain winding-type shutter, the same type as was incorporated in Leica cameras. Between 1 / 500 and 1 / 30 sec., the front curtain functioned as a mechanical timer. The front curtain was wound for a while, then it released the rear curtain to form a slit. This mechanism was very popular, and could be found in later Nikon cameras all the way to the Nikon F2. For 1 / 20 to 1 sec., time exposure, resistance and operating time were switched between two steps by a timer device (known in technical circles as a "slow governor"). However, the two-step switch proved insufficient, as the governor did not function accurately for the rear curtain at 1/20 sec. The rear curtain started traveling upon even the lightest touch by the slow governor, resulting in an unstable and difficult-to-adjust 1/20 sec. shutter speed. The shutter curtains were made of "habutae" silk and one of the surfaces was rubberized. 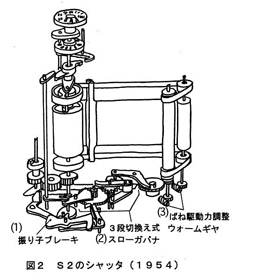 The shutter ribbon was also made of silk, and the shutter-driving spring of piano wire. It took approximately 18 ms. (18 / 1,000 sec.) for the shutter to horizontally travel over the "Nikon format" frame (32 mm width) --- similar to the time for other shutters of those days. The rear-curtain claw, supported by a miniature ball bearing, was an original design. Its smooth rotation was particularly effective when shooting in cold temperatures. A leaf-spring type friction brake was employed in order to prevent the shutter from bounding and causing shadow in the frame and/or double exposure. Compared with today's shutters, the mechanisms in those days did not perfectly shield light; in fact, a significant amount of light entered around the shutter curtains. Improvement after improvement was made in order to reduce the amount of light entering. For the second Nikon model (the Nikon M), the width of the picture format was enlarged and both surfaces of the Japanese "habutae" silk shutter curtains were rubberized. There were no changes to the basic design, however. The shutter unit of the Nikon S, the model which followed the M, shared the basic elements of shutter construction with the M and "I", with the exception of the addition of a sync-contact for flash shooting. The next Nikon camera to make its appearance was the S2. Although its shutter operated on the same principles as previous Nikon models, it also represented a vast improvement. In order to achieve 1 / 1000 sec. shutter speed, the traveling speed of the shutter curtain was accelerated. The S2's shutter curtains travelled horizontally over the frame in only 16 ms (frame width approx. 36 mm). This acceleration in shutter curtain speed brought with it an unwelcome increase in the intensity of rebounds when the shutter stopped. In an attempt to prevent shutter curtain rebounding, a newly developed pendulum-type brake was used. The operating parts of the shutter came in contact with a "weight" which had the same mass as the parts, stopping their movement. This mechanism is reliable and functions accurately, but causes a "flick" sound. The technology itself is still alive, and is now employed for mirror-bounce protection in the Nikon F5. 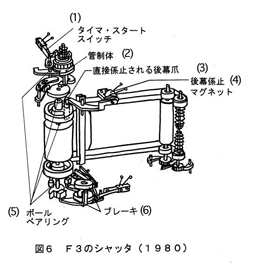 For the most part, the materials for the shutter curtains and ribbons are the same as those employed in the Nikon S.
The slow governor can be switched among three(3) steps. It functions reliably and accurately, even at 1 / 30 sec. 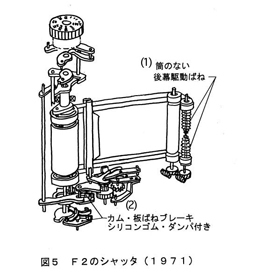 A piano wire is used for the shutter-driving spring. Today, the Nikon F5 also applies a shutter-driving spring made of piano wire. The stainless steel used in other areas of technology cannot be used for this part yet. A worm gear is used for adjusting the spring, enabling a delicate, stepless adjustment. From the Nikon "I" to the S2, modifications to the shutter were minimal. Noticeable change came with the appearance of the "SP sisters". With these models, the shutter speed dial did not rotate when the shutter was released, although it had rotated with previous models. It takes 14.5 ms. for the shutter curtains to horizontally travel over the frame (frame width approx. 36 mm). The accelerated shutter curtain traveling speed helped stabilize 1 / 1000 sec. functions, and also enabled a flash sync speed of 1 / 60 sec. The previously employed brake system was replaced with what was called a "silent brake". 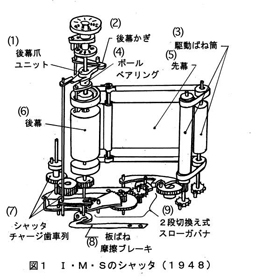 The new system was essentially a spring coiled around a rotating cylinder. The "flick" sound mentioned earlier was eliminated by the new brake. The effect of this sudden change is said to have caused some frayed nerves on the assembly line. The slow governor is very similar to that of the S2. As I mentioned in Vol. 6, camera manufacturers made considerable modifications to the shutter mechanism when they started developing SLR cameras. Since Nippon Kogaku developed the Nikon F and Nikon SP at the same time, the shutter mechanisms of the two cameras were almost identical. The major difference was that with the Nikon F, the shutter was horizontally expanded to create space for the mirror unit. In order to enable the shutter curtain to start when the mirror reached the "up" position, the front-curtain second hook was added, linking the shutter and mirror operations. At first, like the Nikon SP, the Nikon F employed cloth shutter curtains. The shutter of the SP, which incorporated the same mechanism employed in the Nikon F, was later modified to accommodate titanium curtains. Shutter ribbons were also modified for later F models. The new ribbons were made of a combination of chemical fiber and silk. Generally speaking, the F2 gives the impression that it is an upgraded version of the Nikon F. In fact, however, the F2 is an entirely original design, with a significantly modified shutter mechanism. The only elements of the camera inherited from the Nikon F were the two(2) titanium curtains. The traveling speed of the shutter curtain was greatly accelerated --- horizontal traveling speed over the frame reached 10 ms. This enabled electronic flash units to be used at 1 / 80 sec. 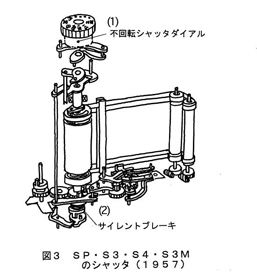 The operating parts of the shutter unit became lighter, and the spring cylinder for the rear curtain was discontinued in favor of a naked spring, which was used to directly drive the rear curtain. Shutter charge gear lines, which rotated as the front curtain was wound, had been in use since the Nikon "I". F or the Nikon F2, however, the decision was made to discontinue their use in order to reduce weight and friction and make rotation more smooth. The brake was made up of a gear and a leaf spring. A silicone-rubber damper, rare at that time, was also used. Much thought went into increasing the smoothness of the release of the shoe from the stopper hook. This well-conceived mechanism was adopted for use in the Nikon F3, F4 and F5, and was recognized as an important technological development. With the Nikon F2, technology for shielding light around the shutter had been almost completed. The next Nikon model, the F3 adopted the horizontal-traveling method, with one glaring difference --- electronic control of the shutter. First, the leading operating unit (called the "control unit") produces a timer start signal to ensure that the front curtain and timer circuit start accurately. The front curtain then begins traveling. The rear curtain, which is pulled up by magnet, starts its movement after a delay set by the timer. One of the most important features of the F3 was the discontinuation of the rear-curtain shoe unit that could be found in every Nikon model dating back to the "I". 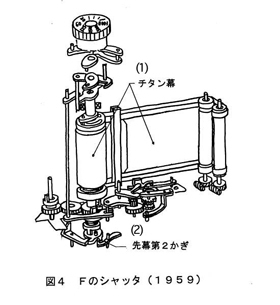 As can be seen in the diagram of each shutter unit for conventional models including the F, the rear-curtain hook stops the rear-curtain shoe unit which is coupled to the rear-curtain drum (a thick drum enveloped by a curtain). Put another way, the rear-curtain hook indirectly stops the drum. On the other hand, with the F3, the rear-curtain hook directly stops and releases the rear curtain. This method offered greatly reduced friction in the rotation of the shutter shaft, as well as in the release time lag. For smoother operation, four ball bearings are used --- one for the control unit shaft, two for the front-curtain shaft and the last one between the front-curtain shaft and rear curtain. This was a significant change, as conventional models had used only one ball bearing. A new brake system was also introduced, in which the brake drum was pressed by a brake shoe. For the first time since the Nikon"I", Nippon Kogaku reviewed the length of the shutter ribbon and the dimensions of the shutter curtain for the F3. The thinner ribbons and smaller curtains contributed to an overall reduction in the size of the camera. By the way, since the Nikon F, the camera's X-contact had been overworked. With the F3, the X-contact is fixed by only one screw, and can easily be replaced. Although the use of a Nikon Speedlight does not damage the X-contact, damage can be caused by certain professional-use flash units that operate at high voltages. We could go on about the technical features of the F3's shutter forever. It was developed with the goal being to make a horizontal-traveling shutter that was perfect in all respects. With the F3, however, Nippon Kogaku was not able to create a "high-speed shutter" that enabled Speedlight synchronization at 1 / 250 sec. After that, they went to work on a "vertical-traveling shutter" for Nikon one-figure F-series models. In this edition, we've looked back at the conception and evolution of the horizontal-traveling shutter through a succession of Nikon cameras. Each shutter unit naturally has its own construction. The differences between the models grew as time passed. By the time the F and F3 came about, full-scale modifications had been undertaken. As engineers and designers became intimately familiar with the workings of the horizontal-traveling shutter, they found many ways to dramatically improve performance and stability. And while daringly modifying the entire inner design, Nippon Kogaku stayed faithful to their lens mount design. Tracing the history of the shutter really lets us see Nippon Kogaku's two "identities". I hope you'll find the next article interesting --- I'm going to discuss the vertical-traveling shutter of the F4 and F5. The history of this shutter also features a blend of steadfast adherence to tradition and bold innovation. Do not look directly at the sun or other strong light rays through a lens or camera. They may cause permanent blindness or otherwise damage your eyesight. This article originally appeared in the Japanese publication "Nikkor Club Quarterly" magazine published by the Nikkor Club. It was re-revised to put it on Nikon's webpage.